Just $7 of materials and a hacksaw and this simple stand can be yours! Sure, an outrageous claim – but it has to be close! 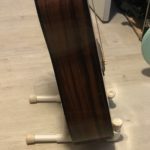 I wanted a small and cheap DIY guitar stand to use at rehearsal, something solid but not industrial strength. I also wanted a small footprint as I find to many stands take up too much space. So after a bit of trial and error here’s what I’ve come up with. 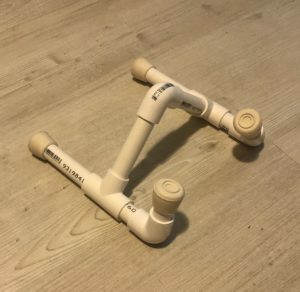 Head to the hardware store and get 15mm PVC pipe (you’ll need 70cm [27.5”] to be safe but get 1 metre [40”] for an acoustic guitar), 3 right angle connectors and two “T” connectors. You’ll also want to grab four 19mm rubber feet. 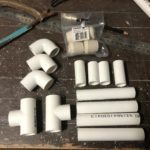 If you are in an imperial measurements country then I think it’s 1/2″ PVC pipe and fittings you use. Next, cut out the following pieces using a hacksaw: 4 x 11cm (4.33”), and 4 x 5cm (1.96”). Put rubber feet on two of the longer pieces and two of the smaller pieces and assemble as you see here! 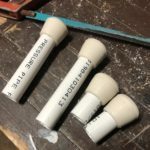 The lengths are important – and while I’m sure you could come up with different lengths to make this work, at least you’ll know with what I’ve got here that it will do the job! The one piece you may need to play with is the 5cm piece that joins the “T” section to the right angle. This is what determines the angle your guitar will be at. Because of the low back piece, you need to keep the guitar quite upright. 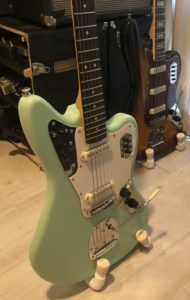 I know that for a couple of my guitars I needed to make that pieces shorter (as short as 4cm [1.57”]) for it to work. I’ve also made one for an acoustic guitar and that piece needed to be 13cm (5 1/8”) to work. 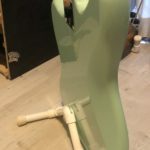 Once you got the whole thing sorted out, you can glue in place all the pieces, unless you want to be able to take it apart for easy transport (I’ve left a couple of joins unglued). The total cost for me is just under $7 per stand – and I’m sure you could get the parts more cheaply if you looked around. And yes, you can paint them – just give the surface a light sand to scuff it up a bit before spraying. The feet are a little tight to fit but you can get them on okay!